Laminate flooring on stairs is mounted differently than on a flat floor. Laminate flooring glue for stair treads and risers. 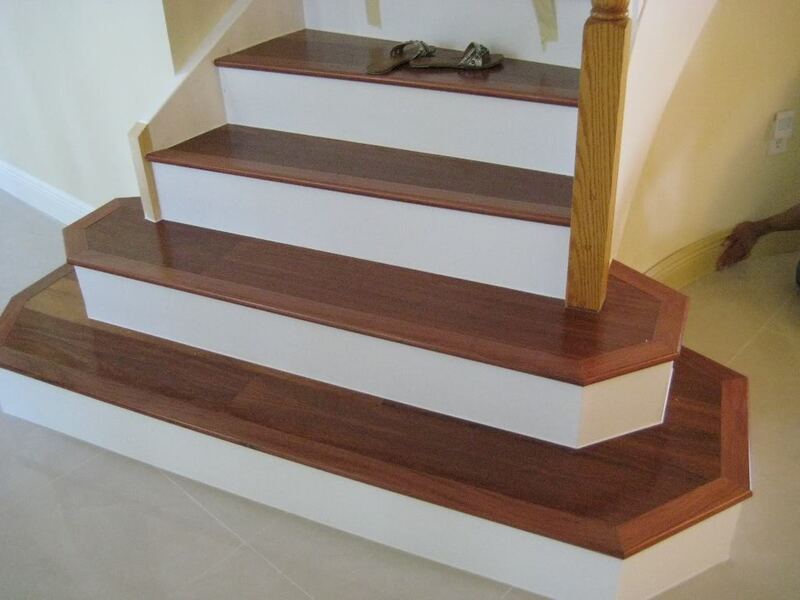 It can be smooth, consider who will be using the stairs before installing it. Small children in footed pajamas or socks can slip and fall. The glossy surface also can make an older person nervous to use the stairs. To put laminate flooring on stairs, Remove carpets or rugs from the stairs. Clean all nails, staples and glue residue from step. Install the skirt to the forefront squared steps. Using glues the inner portion of the edge. Press ahead of a rubber mallet to ensure full contact with the stair riser. 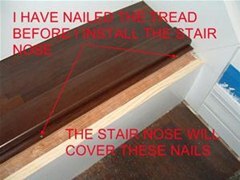 Attach the nosing of stair steps with screws and a screwdriver for added security. I will describe how to prepare and install laminate flooring on stairs. There are several steps involved to do this. Along with the flooring, you will need the stair nose that can be ordered with your laminate. You will need glue to glue the treads on with (you can use wood glue that is used for gluing wood flooring down). These are some of the primary tools you may need: a miter saw- helps a lot to make accurate cuts, a nail gun with 15 or 18 gauge by 2 inch nails and a table saw for cutting the boards length wise. Other tools may include a hammer, scraper, screw gun, utility knife, pry bar and various other hand tools. You need to decide if you want the riser (the riser is the vertical part of the stair) to be the same as the tread or use a painted board. Use a pair of pliers to pull the carpet loose from the tack strip or in a lot of cases staples. 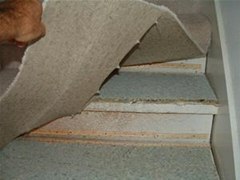 When removing the carpet, be careful as a lot of carpet installers like to use a lot of staples and they are really sharp. Use a pry bar to remove the tack strip. The staples may be hammered in or you can use a dull 4-inch scraper a remove them. Check the stairs for flatness and see that they are level. If not level, sanding them with a belt sander can help this. You may want to drive some screws in them if they are loose or creaking. Scrap each stair with a scraper to remove any debris or high spots. A lot of stairs have an overhang on the top edge. There are two ways to address this. You can either cut the overhang off or fill in the space underneath it. To cut the over hang off you first need to know where to cut. Do this by measuring under the over hang on each side of the stair and transfer this to the top of the stair on each end. Draw a line across the top of the stair. This is where you will cut. You can use a few different saws to cut this with. A reciprocating saw or a jig saw with a long blade or a Skil saw, which is the most dangerous (don’t use this type of saw if your not experienced with it). 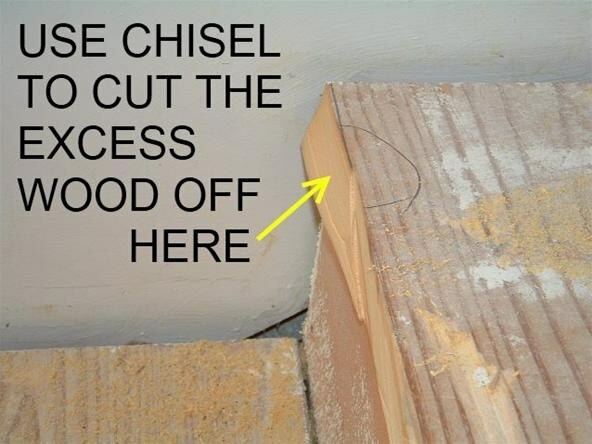 After cutting the over hang off, you may need to use a chisel to make sure it is flush with the riser. In order to cut the laminate planks to fit the treads you may want to split the planks down the middle so you have two equal sized planks on the tread. The tread may be 10 or 11 inches from front to back and the planks can measure 8 inches. You want to cut the treads to fit tight on the sides. The sides may not be square to the stair so you might have to cut them at a slight angle. You also need to know where to stop the tread on the front edge of the stair. To do this you need a piece of the riser your going to use and a piece of the stair nose. The stair nose overlaps the laminate tread, hold a piece of the riser on the front of the stair, use a piece of stair nose and make a mark so you know where to stop the laminate stair tread. After cutting each tread number it and set it aside. The risers need to be flush with the top of the tread so the stair nose will sit level (you can see this in the photo in Step 3. First, cut the riser to fit from side to side. You may need to cut the sides at a slight angle if they are not square to the sides. If you are using a painted wood riser, make sure it is taller than the stair. If you are using laminate flooring as the riser, you will have to connect two planks together so it will be tall enough. After cutting the sides of the riser you need to cut the riser so it is flush with the top of the tread. Before you cut the top of the riser you may need to scribe the bottom of the riser, if the tread below is not flat. The easy way to do this is to set the riser in place (set the riser on the tread that you cut previously before marking it with the pencil) and mark the riser from the back with a pencil where the riser meets the tread. Make your cut on this mark with a table saw. After cutting it set it in place and use the sample of stair nose to make sure it is flush with the top of the tread from one side to the other. You may have to make slight adjustments to make the stair nose fit across the stair. HINT: It is easier to cut the riser a little big the first time and trim a little to get the stair nose to fit just right. Number each riser and the stair where it will be installed and set it aside with the treads. The stair nose needs to be cut tight to the wall on each side of the stair. You may have to cut them at a slight angle like the treads. 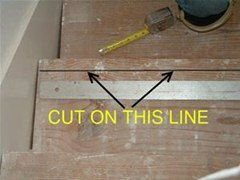 Use a sample of stair nose as a guide to see if it needs to be cut at an angle. As you cut each stair nose number it and number the stair and set it aside. 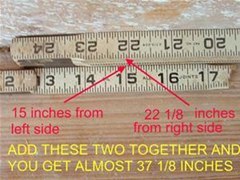 HINT: When measuring the width of the treads, risers or stair nose, to get an exact measurement use two measuring tapes and measure from both sides. You should have all the parts for each stair cut and numbered at this point. ATTACHING THE RISER: Start at the bottom and install the first riser. For installing a painted wood riser or laminate flooring riser, use a good construction adhesive. Put a line of adhesive across the top the middle and the bottom on the back of the riser, not too close to the edges. Push the riser into place. You can nail at the very top with a nail gun, the stair nose will cover these nails. If you are using a white painted riser, you can nail at the bottom and use some white chalk to fill in the nail holes. You don’t have to nail at the bottom, just make sure it is pushed up tight into the glue. ATTACHING THE TREADS: Start on the bottom stair, spread the wood glue on the entire space where the tread will be placed. Place the tread into the glue and push it down to get good contact with the glue. You can nail at the very front edge with a nail gun (the stair nose will over lap the edge and hide the nails). You can also nail at he back edge of the tread as close to the edge as possible (the riser will sit on the tread and hide the nails here also). After installing the tread install the next riser on top of the tread and continue up the staircase. When all the treads and risers are installed, then install all the stair noses. 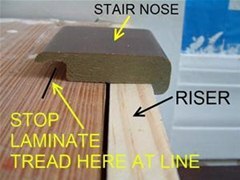 ATTACHING STAIR NOSE: Use construction adhesive to glue the stair noses in place. To assure that the stair nose stays secure use a nail gun and shoot 3 to 4 nails across the width of the stair nose (do not nail too close to the sides). Use a matching putty to fill in the nail holes. Try not to walk on the stairs anymore than you need to for about 24 hours, this should allow enough time for the glue to set up. Hopefully all your cuts are tight to the edges and you are happy with your new stair case. Always wear protective equipment when working with power tools.